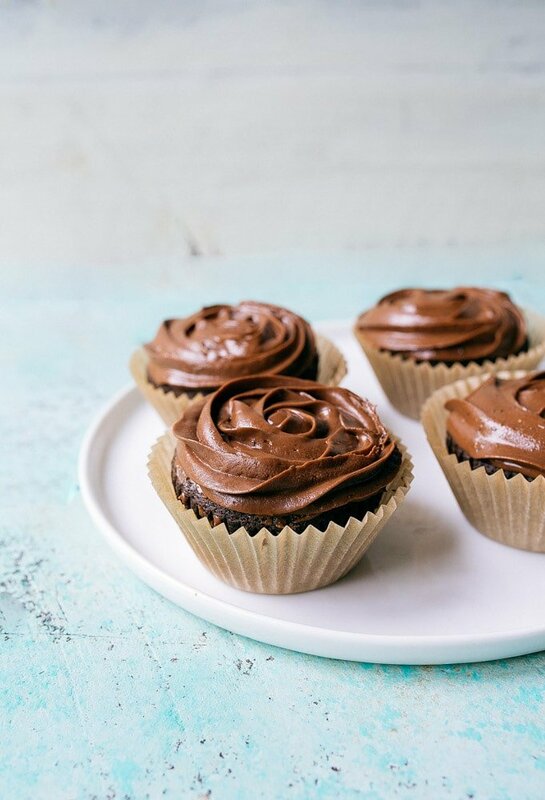 Vegan chocolate cupcakes with vegan chocolate frosting just for you and me! Admittedly, the only non-vegan ingredient in my regular small-batch of chocolate cupcakes in my Sweet & Simple cookbook was buttermilk. Happily, the recipe was already egg-free, and so all I have to do is find a buttermilk substitute, right? Substituting milk alternatives for cow’s milk is easy, right? Wrong. After a few rounds of sunken cupcakes made with random milk alternatives, I settled on unsweetened almond milk as the best thing to use. Don’t use coconut milk from the can (the extra oil is problematic) or homemade almond milk (too thick, presumably because of the dates). Anything thin and white will work. Alternative milks with texture or excess oil won’t work. But let’s talk about what we do have: vegan chocolate cupcakes (small batch) with a ridiculously creamy chocolate buttercream on top. We need to talk more about the frosting. It’s just peanut butter, coconut oil, cocoa powder and powdered sugar! I also added in some espresso powder, because I really don’t make chocolate desserts without it. So so so good, you guys. I refrigerated it so that it would be pipe-able, but after just a few minutes in my hot house, it melted. But it’s okay, because it was still so good. I would say to save yourself the trouble of the piping bag, just frost these cupcakes with a knife and devour. I’m always a proponent of getting a dessert into your mouth the fastest way possible. After stirring the frosting ingredients together, I refrigerated it for about 20 minutes in the frosting bag. I used melted coconut oil for the frosting, and so it needed some time to set again. About 5 minutes after I piped it out, it started weeping. It’s okay, though. 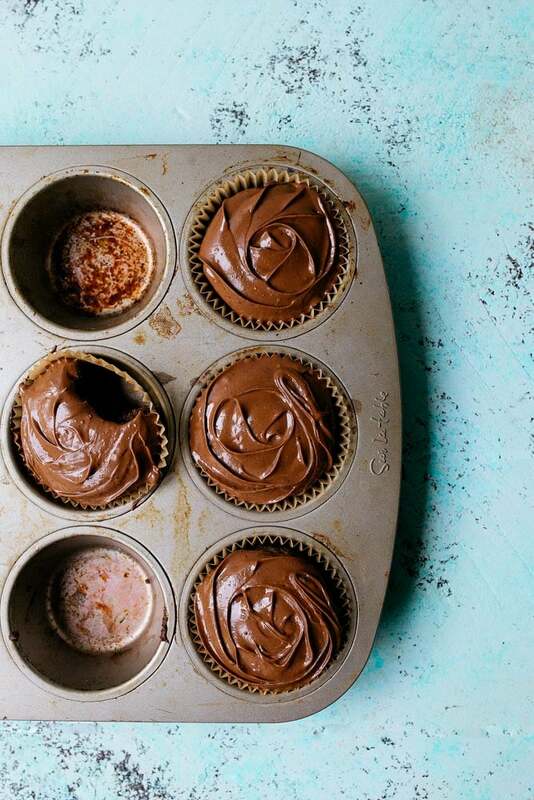 You don’t need to photograph your cupcakes like I do—you just need to eat them. You can definitely pipe the frosting, and store them in the fridge before serving! Since our cupcakes don’t contain butter, they won’t harden in the fridge like regular cupcakes. Oh, how I love a good cake recipe made with oil! It’s a bakery and wedding cake maker secret, did you know? I hope you enjoy these vegan chocolate cupcakes, small batch. Let me know if you have any other vegan dessert requests! 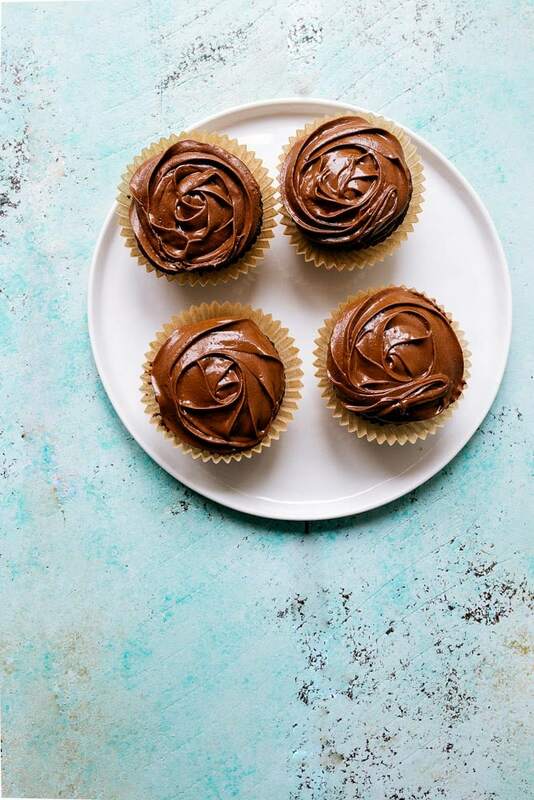 Vegan chocolate cupcakes, small batch recipe that makes just 4 cupcakes. Preheat the oven to 350. Line a regular muffin pan with 4 liners. Set aside. In a medium bowl, whisk together the flour, cocoa powder, baking soda, baking powder, and espresso powder. In a small bowl, whisk together the almond milk and apple cider vinegar. Stir in the oil, vanilla, and brown sugar. Whisk very well to combine. Stir the wet ingredients into the dry, and divide the batter between the 4 cupcake liners. Bake for 15-17 minutes, or until a toothpick inserted comes out cleanly, with only a few crumbs clinging to it. Next, make the frosting: in a small bowl, whisk together all of the frosting ingredients. It will resemble pudding. Refrigerate for about 20 minutes to firm it up, and then frost the cupcakes. (You can put it in a frosting piping bag like I did and pipe swirls, but know that they will melt considerably when in warm rooms! I would live more vegan small batch cupcakes and mini cakes. Pumpkin, strawberry, or a berry chantilly (like while foods) would be awesome. I’m loving your vegan small batch recipes! Thanks so much for developing these! These look AMAZING! Did you use natural or dutch-processed cocoa powder? THANkS! Natural! Sorry for any confusion. Dutch processed cocoa powder scares me! It would be great if calories per cupcake or per batch were included. I’m working on that behind the scenes, Hannah. It’s actually not a quick fix, as I have hundreds of recipes on this site that would need to be updated with calorie info. But someday soon! 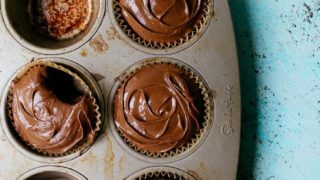 Vegan chocolate desserts are oftentimes even yummier than non vegan so these cupcakes look amazing-I love that there’s pb in the frosting too! I made these today for my family and OH MY were they GOOD!! Absolutely loved the texture and flavor! Thank you! I really like small batch recipes! Thank you! Your small batches are perfect for those of us whose children are grown and gone. Thanks and keep making your magic! hey girl- these look oh so yummy! Can I triple this recipe to make 12 cupcakes? Have you tried the recipe with gluten free flour or alternative? Just wondering if the same amount of flour would be required? I have not, Megan. I’m sorry! I’m wondering if someone in the comments section has, tho! Just made these and they were perfect. I did add additional coconut oil to the frosting in order to get the right consistency and it turned out amazing! Thanks for the recipe! I’m a new vegan and I was looking for a chocolate cupcake recipe to try. This was the first one that popped up on Google, and just let me say: THANK YOU! These are the best chocolate cupcakes I’ve ever made, and my carnivore family devoured them, too, gushing over them the whole time. Keep up the great work! 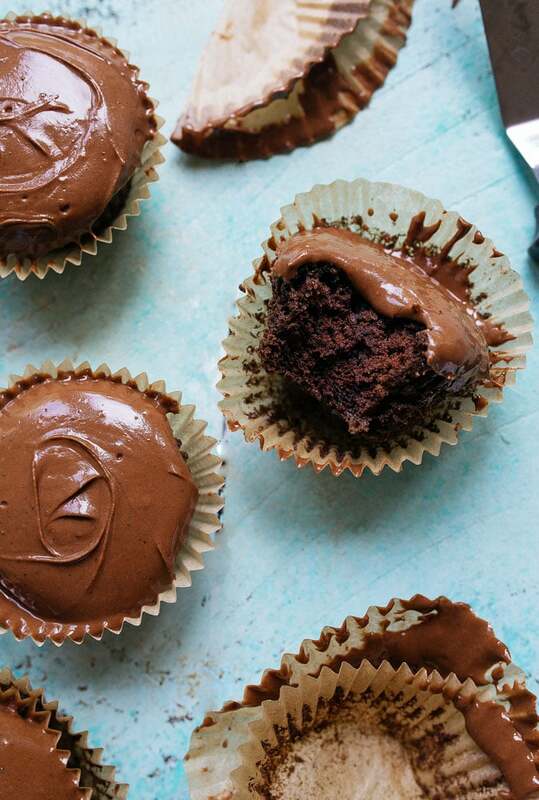 Have you tried palm shortening in the icing instead of coconut oil? I often use it in place of butter or Crisco when I do allergy-friendly cupcakes (I haven’t ventured into gluten free, but I do dairy, egg, so, and nut free items – obviously this wouldn’t be nut free). Palm shortening has a higher melting point than coconut oil, so it might help with the frosting weeping.